I will go back later in the month and hope that many of you can visit also. Pat's work is just fascinating to take in. She works predominantly in large format, but the detail in the individual sections is just exquisite. 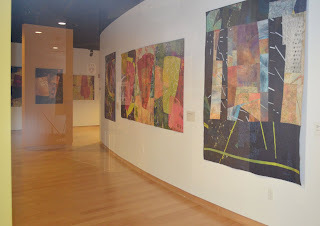 I am really limited in what I can share, due to photographing through the glass walls, but you can get a sense of the pieces from these few photos. It should whet your taste to go see in person. One thing that I loved, even from the outside, is that the gallery walls are a variety of pastels and the art quilts were hung to really take advantage of the varying hues of backdrop. Hope you can make it. 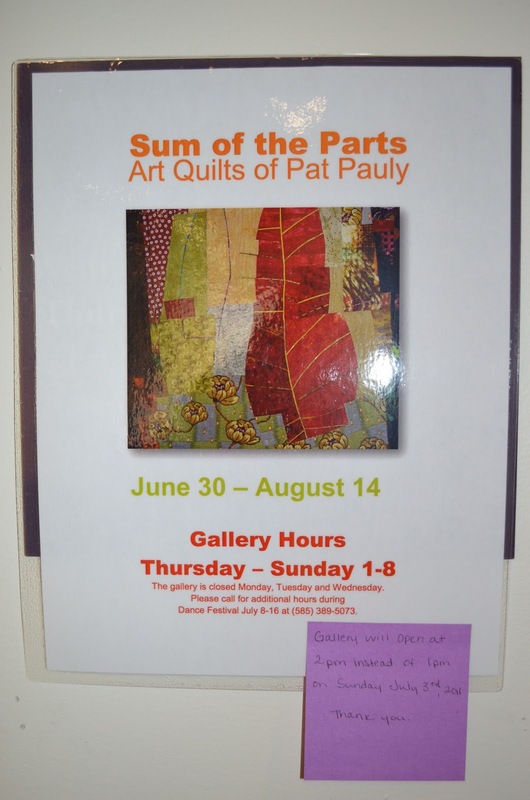 Pat's work is really worth seeing! I always enjoy stopping by. You visit so many wonderful exhibits. Thanks for sharing Judy! Thanks, Chris. It is always fun finding new galleries and exhibits but really special when I see something close to home and by someone I know! Thanks for the nice write-up. And you will enjoy it even more when there is no glass between you and the work. How unfortunate! Hope that never happens again. But it is summer, and the staff are mostly students! Worth the second try.